This is my 12 days of Christmas - a wish list published for my husband and kids (mostly) and anyone else who wants to buy me gifts for the holidays! For my first item on my list in 2017, I'm kind of going for a combo. I ask for eyeliner nearly every year, but I've come to the realization that I can't see my eyes clearly enough to line them. So if you were already counting on me asking for some of my regular make-up, by all means, feel free to get it for me! 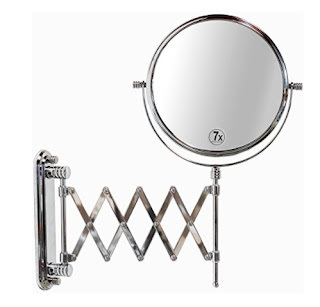 But I really want to make sure I am putting it on where I intend it on my face, so I am in need of this make-up mirror. I would LOVE a light-up one, but that seems to add $50 to the price. I'm not sure how much everyone likes me, so I'll be sure and shoot a little lower. Necessary features do include the wall mount. There were some great looking light-up mirrors that like suctioned to an existing mirror, but that would leave me way too far away. My old eyes need a close look if I'm going to avoid looking like Pennywise. My favorite eyeliner for years has been the Make-up Forever Aqua Eyes. While I tried some fun different shades last year (or the year before? ), I really gravitate toward the dark ones. Just how I roll ;) I would like to try wearing more fun lip colors, though, so a clear lip liner would be great to help with feathering, and let me color as far as I can on my narrow lips. In the meantime, if these are things you use and like, or you have another brand/style/whatever to recommend, I'm not much of a make-up guru, so feel to chime in on the comments! I would appreciate it (and so would the people who have to look at me every day...). I trust you when it comes to makeup because I don't wear much of it, lol. Just some eyeshadow + mascara. A friend recently was like "but you don't wear makeup" which kind of surprised me ... :/. Just mascara here after having my brows microbladed.